From a work of Alphonse Mucha (1860-1939), this "Mucha Rubis" (Ruby) tapestry shows his love of portrayal of women by this Czech Art Nouveau artist. Here we see a woman in a ruby shawl and surrounded by red flowers as she walks through the garden. 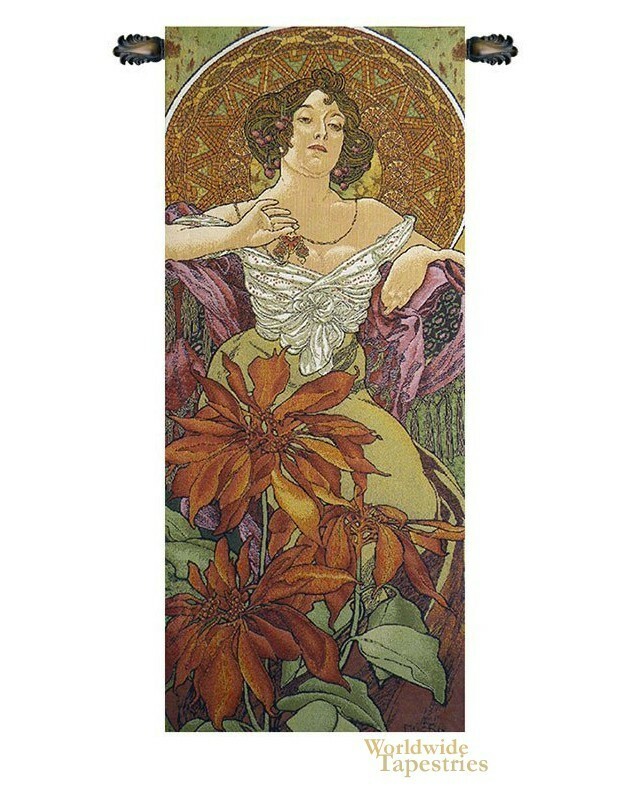 The folds in her garment as in the details of the leaves are beautiful and are the hallmarks of Mucha's works, which places women in natural surroundings in an illustrative style. This art nouveau tapestry "Mucha Rubis" is backed with a lining and has a tunnel for easy hanging. Note: tapestry rod and tassels, where pictured, are purchased separately. Dimensions: W 20" x H 45"
Dimensions: W 27" x H 64"